The Hydrogen energy levels calculator helps you to compute the energy levels of the hydrogen atom and hydrogen-like atoms and ions. You will also find answers to questions like: how many energy levels does hydrogen have or how to calculate ionization energy of hydrogen. The hydrogen atom is made of an electron and a proton. The electron has negative electric charge while the proton has the positive charge. This means that there is an attractive force between them, called the Coulomb force. The mass of the electron is much smaller, around one thousand times smaller, than the mass of the proton. Because of this, we can think about the electron as orbiting around the proton. The energy of the electron comes from balancing the attractive Coulomb force and the centrifugal force of circular motion. The law's of quantum mechanics predicts that the energy of the electron in such situation can take only certain values. We call these values of energy the energy levels. There is the lowest energy level, where the electron is as close to the proton as the Heisenberg uncertainty principle allows. The higher the energy level the further from the proton the electron is. The energy level tells us also how tightly the electron and proton are bound. The lower the energy, the tighter the binding. n is the energy level. The energy is measured in electronovolts, 1 eV = 1,6 x 10-16 J. The most important number is n which sets the energy level. Value n = 1 gives the energy of the lowest energy level. Note that the energy is negative. This means that whenever a proton and electron come close to each other, they will likely form a hydrogen atom. In our calculator you can also modify the atomic number, the default value is Z = 1 which correspond to the hydrogen. You can read the Hydrogen-like atoms section below to learn more about the meaning of Z and how you can use this energy levels formula for other atoms and ions. There is an infinite number of energy levels. However, if you play a bit with the hydrogen energy levels calculator, you might notice that when n is large the difference of energies between neighboring levels decreases. This means that the high energy levels are becoming hard to distinguish from each other. Their discrete nature, due to the quantum physics, fades away. The last, though infinite, energy level has energy equal 0. Beyond that energy electron and proton do not form anymore a bound state and are just two independent particles. What is the ionization energy? Ionization energy is energy required to rip one electron from the atom. In other words, it is the energy needed to overcome the binding energy. The minimal energy to separate the electron from proton is then the energy difference between the energy when the electron is free and the energy level of the electron. If the electron is on the first level, then this energy is exactly equal to 13,6 eV. The formula for the energy levels works not only for hydrogen but also for another ions like He+, Li2+, Be3+ and B4+ which have a single electron. In these hydrogen-like atoms numbers of protons might be larger than one which leads to a stronger Coulomb attraction and lowers energy levels. You can easily change the number of protons, usually called atomic number Z, in our calculator to see this effect. You can explore another quantum mechanical phenomena in our De Broglie wavelength calculator. 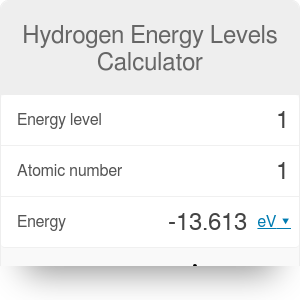 Hydrogen Energy Levels Calculator can be embedded on your website to enrich the content you wrote and make it easier for your visitors to understand your message.